Welcome to the next level of outdoor cooking. Harness the heat and pressure. 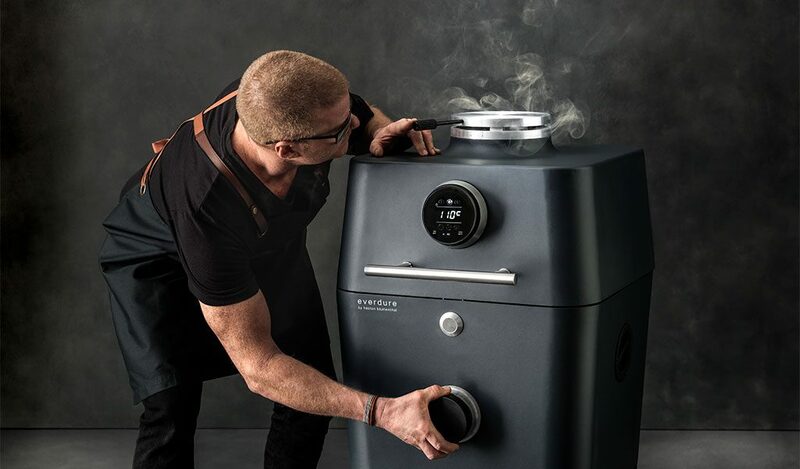 The new 4K charcoal BBQ is developed alongside the 3 Michelin star chef, Heston Blumenthal, turning up the heat in the garden. The 4K takes outdoor cooking to the next level, featuring technology developed from the Everdure Charcoal range, including the Fast Flame Ignition System. The Australian barbeque specialists, Everdure, and Heston have designed the ultimate kamado-style grill. Whether it’s burgers, steak, a leg of lamb or a pizza; it does it all. There is nothing you can cook in a domestic indoor kitchen that you cannot cook outdoors in the revolutionary 4K BBQ grill. The latest technology gives you real-time results and puts the fire at your fingertips. Connect your mobile phone to the touch glass display and download the free app, packed full of outdoor cooking recipes, tips and alerts. A kamado-style charcoal grill for all occasions; from burgers and pizzas to leg of lamb and Christmas dinner. The 4K is a solid machine constructed from diecast aluminium and thick gauge metal. The unique insulation design reduces heat transfer to the outer body making the exterior completely cool-to-touch. The 4K’s unparalleled airflow control system makes regulating the heat a unique experience. Top and bottom vents are precisely numbered for a more even and responsive flow of air. Evidence of kamado-style cooking with ceramic and clay equipment dates as far back as 4000 years ago. This method of cooking has evolved significantly throughout the ages to be treasured by many cultures around the world today, and now the next leap of innovation in this space has arrived. Merging the rich history of charcoal cooking with precise technology and a modern design aesthetic, the 4K brings the authentic flavour of charcoal that humankind has enjoyed for millennia, to your home more efficiently than ever before. The 4K BBQ will be available in the UK in 2019. Find a retailer near you.